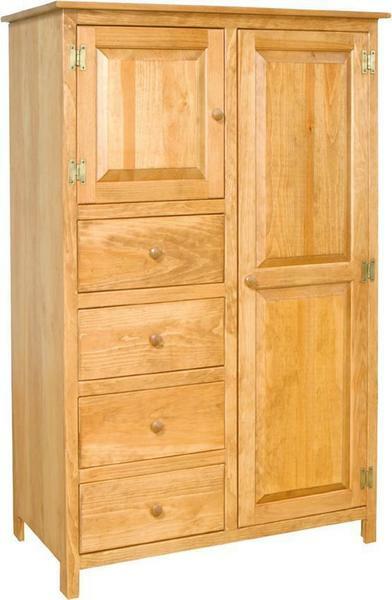 Our Amish Wardrobe Armoire is the perfect product to help expand your closet space. This stunning piece of Amish furniture has a unique vintage look that is sure to impress. Perfect for anyone in need of additional bedroom storage, this solid wood wardrobe armoire can be finished in any of a variety of stains or paints to match your existing bedroom furniture or personal style. It also is great for storing linens and extra pillows for out of town guests. Choose to have this Amish wardrobe armoire stained as shown in the photo or go with one of our many other professional finish options. This handcrafted Pine Armoire is a part of our Quick-Ship collection that will be ready to ship in just a couple of weeks! Craft Storage Cabinet - If you and your family love to do crafting why not consider ordering a storage cabinet to keep all of your arts and crafts supplies organized. Customize your craft storage cabinet to fit your needs. Linen Cabinet - Everyone has plenty of blankets, throws, pillows, table cloths, & place mats, but never enough room to store them. Turn this cabinet into a functional linen cabinet to keep yourself organized and store your blankets and linens inside this beautiful pine armoire. Bar Cabinet - Are you big on entertaining but don’t have a handy spot to store all of your bar accessories? Your happy hour will be easy & accessible with this bar cabinet for all of your bar storage needs. Just open the doors and let the party begin! Dining Room Storage Cabinet - If you have a lot of large entertainment accessories such as china, bowls, servers, and trays, then this pine armoire is the perfect place to fit those over sized items. This beautiful pine furniture will fit in nicely with your dining room decor. This stunning solid pine wood armoire is handcrafted by skilled Amish woodworkers in the heart of Pennsylvania. All of our Amish furniture is handmade in the USA! Call toll free to speak with a friendly and knowledgeable Amish furniture specialist at 1-866-272-6773. Email your questions or custom furniture quotes to questions@dutchcrafters.com. Visit our brick and mortar Amish furniture store in Sarasota, Florida for design assistance and to view the furniture firsthand. Yes it is over. I received the replacement wardrobe today in perfect condition and it was exactly what I ordered. Your delivery service driver - "Daniel" - communicated well with me about his arrival. He was very professional in the delivery and pickup of the returned wardrobe. I want to thank you and the others involved with this long, sometimes confusing transaction. Again, Thank you and your organization for this successful transaction. We ordered two of these Armoires and use them in our master bedroom in place of closets. Love them. Product arrived in excellent condition. It is used in a spare bedroom, and yes, I would recommend it to others.